Amazon has got this 100-count pack of LineOn Premium Gel Pens for $12.47 with free Prime shipping. It got 4.4 out of 5 stars over 396 customer reviews, and is an "Amazon's Choice" item. 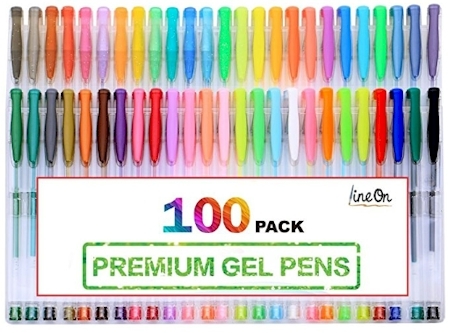 Lineon gel pens set contains 50 unique colors gel pen plus 50 refills are ideal for adult coloring books. Long lasting and durable tips also provide smooth writing for coloring, doodling and drawing. Non-toxic, acid free. Assorted color types in one pack: Glitter, neon glitter, metallic, neon, pastel and standard. Delicate color box with trays inside packing provide easy selection for customer and good protection for pens.